The study of the interaction of intense optical pulses with materials is as old as the subject of nonlinear optics itself. Experiments in the sixties established that a host of complex physical processes could act in concert as local field intensities approached the material breakdown threshold. In general, ionization of the material, electrostriction, stimulated scattering (Raman and Brillouin 3-wave processes), thermal breakdown, and other phenomena occurred simultaneously in the breakdown region. The consequences of these interactions were generally so catastrophic that little progress could be made in establishing a quantitative understanding of the role of the separate physical processes involved . Recent progress in producing ultrashort optical pulses in the femtosecond to picosecond regime has opened up the possibility of isolating these complex material interactions in bulk materials. 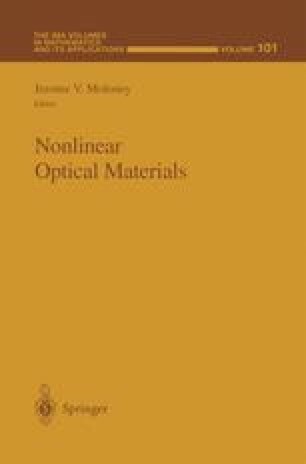 Dimensionality of the material plays a significant role in influencing the nature of optical pulse propagation in different materials.